The $1.2 trillion student loan problem is easy to fix if Congress has the will to do it, Sen. Elizabeth Warren, D-Mass., told CNBC Tuesday. "Bring down the interest rate on those student loans, help more people get current on their loans, get them back into payments that they can manage, and let's get this economy rolling forward," the senator said in an interview with " Street Signs ." On Wednesday, the Senate is scheduled to vote on Warren's bill, which would allow borrowers with outstanding student loans to refinance their debt at the same rate that current recipients get. Currently, undergraduates pay 3.86 percent on their debt and graduate students pay 5.41 percent. Those rates came about as part of a bipartisan deal reached last year that ties interest rates to the financial markets. "We have ... $1.2 trillion in outstanding student loan debt, and what we know about that debt that's outstanding is that it is crushing individuals, and it is now acting as a drag on the economy," Warren said. "Young people are not buying homes, they're not starting small businesses, they're not buying cars, they're not making the purchases we would expect them to make to move this economy forward." The bill would be financed by the so-called "Buffett Rule," inspired by billionaire Warren Buffett, which would raise taxes on millionaires by imposing a minimum effective tax rate. It's expected to face fierce opposition by Republicans. 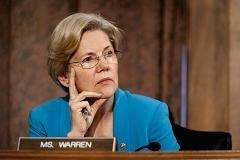 Warren admits it will take more than lowering interest rates to help beleaguered college students facing high tuition. She also thinks colleges need to do their part. For-profit colleges are covering 10 percent of all students, "sucking down" 25 percent of student loans and are responsible for about 48 percent of all student loan defaults, she said. And it's the taxpayers and students on the hook for those loans-not the college. "We need to align the incentives so that colleges have an incentive to keep down their costs ... to graduate students on time with degrees in areas where they're going to be able to get jobs and going to be able to pay back those loans," Warren said.